13 September 2017 – Efforts to fully realize people’s economic potential – in countries at all stages of economic development – are falling short due to ineffective deployment of skills throughout the workforce, development of future skills and adequate promotion of ongoing learning for those already in employment. These failures to translate investment in education during the formative years into opportunities for higher-quality work during the working lifetime contributes to income inequality by blocking the two pathways to social inclusion, education and work, according to the World Economic Forum’s Human Capital Report 2017, which is published today. The report measures 130 countries against four key areas of human capital development; Capacity, largely determined by past investment in formal education; Deployment, the application and accumulation of skills through work; Development, the formal education of the next generation workforce and continued upskilling and reskilling of existing workers; and Know-how, the breadth and depth of specialized skills-use at work. Countries’ performance is also measured across five distinct age groups or generations: 0-14 years; 15-24 years; 25-54 years; 55-64 years; and 65 years and over. 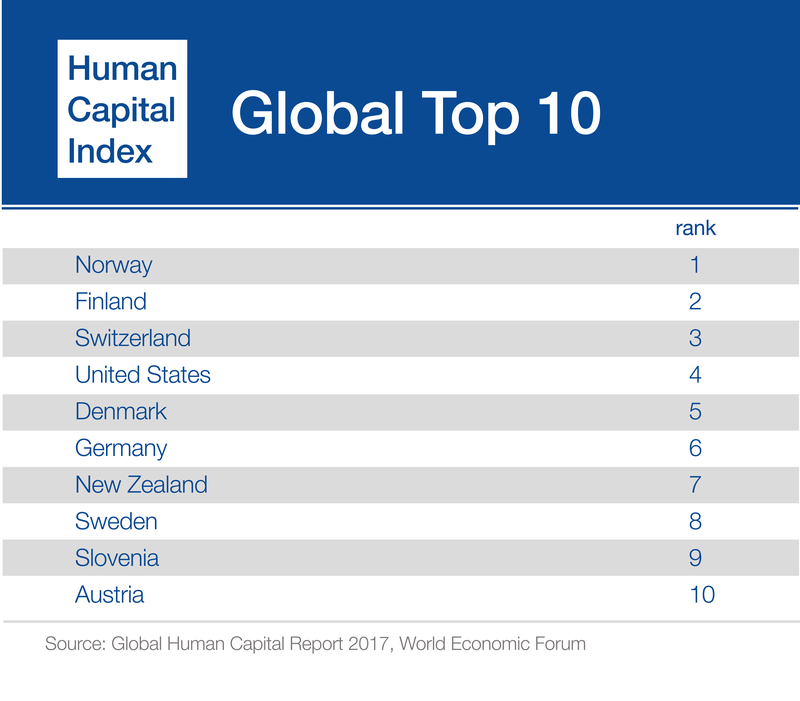 According to the report’s Human Capital Index, 62% of human capital has now been developed globally. Only 25 nations have tapped 70% of their people’s human capital or more. With the majority of countries leveraging between 50% and 70% of their human capital, 14 countries remain below 50%. A fundamental tenet of the report is that accumulation of skills does not end at a formal education, and the continuous application and accumulation of skills through work is part of human capital development. All too often economies already possess the required talent but fail to deploy it. While much is often made of intergenerational inequalities when it comes to the realization of human capital, the report finds every generation faces considerable challenges when it comes to realizing individual potential. For example, while younger people are consistently better off than older generations when it comes to the initial investment in their education, their skills are not always deployed effectively and too many employers continue to look for ready-made talent. The problem of under-deployment of skills among the young also affects those coming towards the end of their working life. Meanwhile, few among those currently in employment – across all age groups –are gaining access to higher skilled work and opportunities to enhance know-how. “The Fourth Industrial Revolution does not just disrupt employment, it creates a shortfall of newly required skills. Therefore, we are facing a global talent crisis. We need a new mind-set and a true revolution to adapt our educational systems to the education needed for the future work force,” said Klaus Schwab, Founder and Executive Chairman, World Economic Forum. “Human capital is not a fixed concept – it can be enhanced over time, growing through use and depreciating through lack of use – across people’s lifetimes. This means we need a more proactive approach to managing the transition from education to employment and to ongoing learning and skills acquisition for today’s workforce. Otherwise, every country risks creating lost generations,” said Saadia Zahidi, Head, Education, Gender and Work, World Economic Forum. "Skills are the fundamental unit of human capital. Knowing which skills are most resilient, most persistent, and most likely to remain relevant through technological innovation and economic change is key to successfully upskilling and reskilling workers. Using our data to arm governments and broader policy communities with a richer understanding of skills dynamics can and should fuel more nuanced and strategic investments in building human capital for the future,” said Guy Berger, LinkedIn Economist. North America is the strongest regional performer, with an average score of 73.95. The United States (4) ranks in the top 10 and Canada (14) in the top 20. A research partnership with LinkedIn sheds new light on education and skills around the globe. Within the broader scope of expansion of higher education between generations, there has been a shift in the choices made by students on which subjects to specialize in as well as an expansion of the set of degrees on offer. Some fields of specialization, such as business administration and management see continued substantial representation by age group across all generations. Others such as economics have declined as the proportion of degrees amongst younger generations. Degrees such as computer science have been growing as a proportion of the degrees held by younger generations. Finally, degrees such as psychology have resurged as a proportion of the degrees held by the youngest cohorts, matching the popularity they once held amongst the oldest cohorts after having dipped among the middle cohorts. While expanding education access and undertaking curricula reform are critical for ensuring that future generations are prepared for a changing labour market, the Human Capital Report 2017 emphasizes the vital nature of continuous skilling, upskilling and reskilling through the workforce. This requires employers to provide learning opportunities to their workers and see these as investments, governments to take a holistic view to broadening and deepening the skills-specialization and complexity of work across their economies, and individuals to see learning as a lifelong activity.